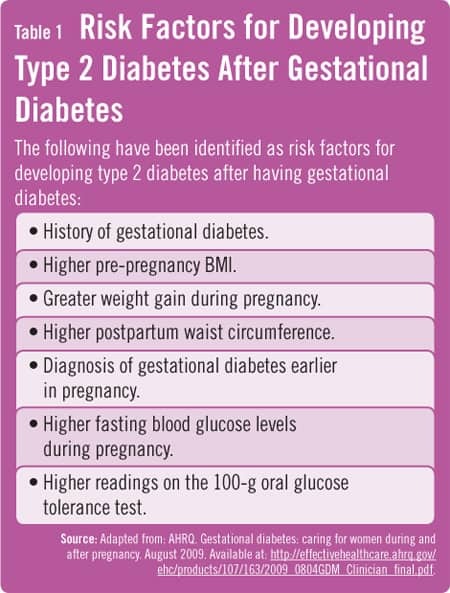 According to the CDC, the reported rates of gestational diabetes mellitus (GDM) range from 2% to 10% of all pregnancies. Immediately after pregnancy, 5% to 10% of women with GDM are found to have diabetes. In the United States, women who have had GDM have more than a 60% chance of developing diabetes in the next 10 to 20 years. Poorly controlled diabetes carries more serious risks. These risks include large size, preeclampsia, pre-term delivery, stillbirth and respiratory distress, and other problems for the newborn baby. However, optimizing blood glucose levels before and during pregnancy may reduce these risks. Published research has documented that GDM carries risks for both mothers and neonates. In the American Diabetes Association’s Standards of Medical Care in Diabetes—2011, the Association officially adopted new diagnostic criteria for GDM based largely on findings from the Hyperglycemia and Adverse Pregnancy Outcomes (HAPO) study. This was a large-scale multinational epidemiologic study involving about 25,000 pregnant women. It demonstrated that the risk of adverse maternal, fetal, and neonatal outcomes continuously increased as a function of maternal glycemia at 24 to 28 weeks, even within glycemic ranges previously considered normal for pregnancy. For the complications examined in the study, there was no glycemic threshold for risk. Results from the HAPO study have led to careful reconsideration of the diagnostic criteria for GDM. 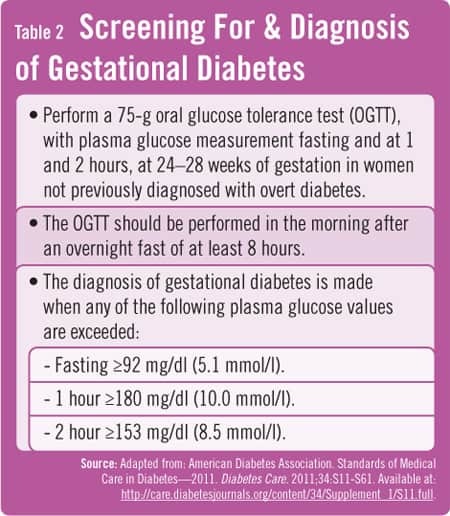 The International Association of Diabetes and Pregnancy Study Groups, an international consensus group with representatives from multiple obstetrical and diabetes organizations, including the American Diabetes Association, developed revised recommendations for diagnosing GDM (Table 2). The group recommended that all women not known to have diabetes undergo a 75-gram oral glucose tolerance test (OGTT) at 24-to-28 weeks of gestation. Additionally, diagnostic cut points were established for the fasting, 1-hour, and 2-hour plasma glucose measurements. “The new criteria for diagnosing GDM will significantly increase the prevalence of the disease,” says Dr. Metzger. “This is primarily because only one abnormal value—not two—is sufficient to make a diagnosis.” The American Diabetes Association noted in its Standards of Medical Care in Diabetes—2011 that the diagnostic criteria changes were made in the context of worrisome increases in obesity and diabetes rates with the intent of optimizing gestational outcomes for women and their babies. Two randomized controlled treatment trials of “mild” GDM have shown benefit of treatment and the treatment primarily involved lifestyle changes and medical nutritional therapy. However, Dr. Metzger adds that there are few data regarding therapeutic interventions in women who will now be diagnosed with GDM based on the new diagnostic criteria. “We’ll need to design studies to determine the optimal intensity of monitoring and treatment of women with GDM diagnosed by the new criteria,” he says. AHRQ. Gestational diabetes: caring for women during and after pregnancy. Available at:http://effectivehealthcare.ahrq.gov/ehc/products/107/163/2009_0804GDM_Clinician_final.pdf. Lawrence JM, Contreras R, Chen W, Sacks DA. Trends in the prevalence of preexisting diabetes and gestational diabetes mellitus among a racially/ethnically diverse population of pregnant women, 1999–2005.Diabetes Care. 2008;31:899-904. HAPO Study Cooperative Research Group, Metzger BE, Lowe LP, Dyer AR, et al. Hyperglycemia and adverse pregnancy outcomes. N Engl J Med. 2008;358:1991-2002. Boyd E. Metzger, MD, has indicated to Physician’s Weekly that he has or has had no financial interests to report.